ST. LOUIS – St. Louis Blues Executive Vice President and General Manager Doug Armstrong announced Wednesday the club has signed forward Jason Arnott to a one-year contract. The Blues signed free agent forward Jason Arnott to a one-year contract on Wednesday (Getty Images). Arnott, 36, has played 17 National Hockey League (NHL) seasons, appearing in 1,172 games, compiling 904 points (400 goals, 504 assists) along with 1,216 penalty minutes. Last season, the 6’5”, 220-pound forward played in 73 games between the New Jersey Devils and Washington Capitals, tallying 31 points (17 goals, 14 assists). 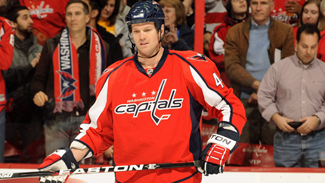 A former member of the 2000 Stanley Cup Champion New Jersey Devils, Arnott has recorded 72 points (31 goals, 41 assists) in 115 NHL playoff games. In addition, he served as captain of the Nashville Predators for three seasons (2007-2010) and ranks sixth among active players in career games played and seventh in points, scoring 20 or more goals in 12 different seasons. The Collingwood, Ontario native was originally drafted by Edmonton in the first round, 7th overall, of the 1993 NHL Entry Draft.